Barbara Kingsolver has said: "At it's heart, a genuine food culture is an affinity between people and the land that feeds them." Which describes well the impulse behind the current urban farm/backyard food garden/farm-to-fork movement. In our madly urbanizing world, whole generations of people who have always lived in cities, have felt the call to connect with the land. But what about those still tied to the land, and to traditional farming practices? For such peoples it is probably not about a food culture, but it is the very basis of existence, their society and culture that relies on such an affinity. 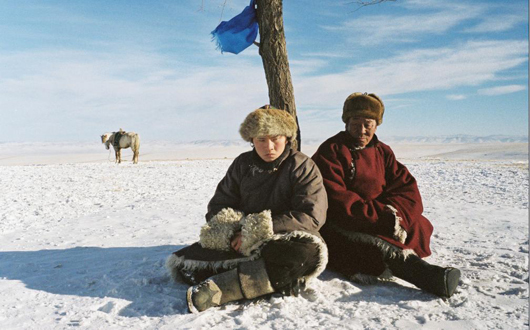 In this vein, I highly recommend Khadak, a beautiful surreal narrative film in the tradition of Tarkovsky and Sergei Parajanov, that examines the social and spiritual effects of official relocation programs on Mongolian herders. The film moves from the stark, vast landscape of the Mongolian steppes, to the 'drosscape' of a coal mine and finally into the modern Chinese city. It is an open critique of political and social policies towards farmers and ethnic minorities - and it is an accidental critique of land use policies and centralized planning efforts. The effects of the mandatory 6-8% growth rate on the Chinese landscape cannot be understated, and this film is a great essay on lost agrarian landscapes and the attitudes and policies behind that loss. It is also a glimpse into the changing landscape, it's design and values.